Moulin d’Ibure is a former water mill. 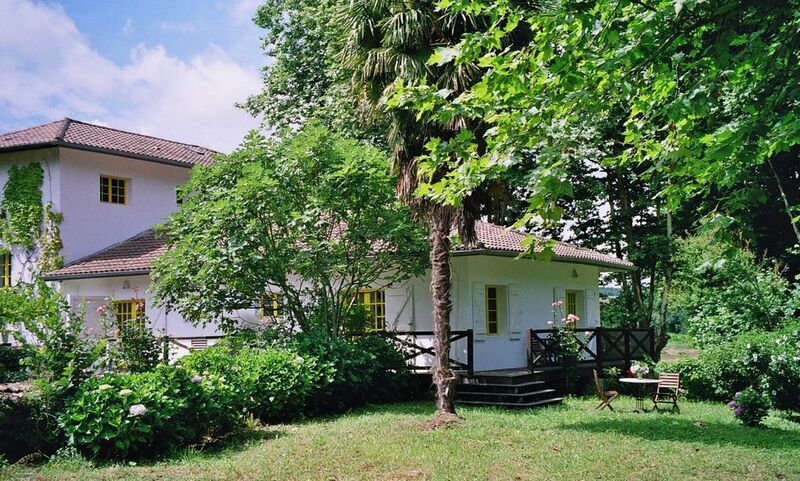 It is situated nearby the Atlantic coast only 30km East of Biarritz in quiet rural surroundings at the border of the village Bardos at the small river Lihoury. The property covering about 7,4 acres has a vast garden with very old plane trees, meadows, flowered bushes and subtropical plants. It consists of two houses: the ancient original mill building presented here, and the former house of the miller. They have been completely renovated and equipped as comfortable vacation homes and newly furnished in a bright and tasteful style. Both homes are independent units, each with own separate entrance, terrace and a large private area of the vast garden, which is clearly devised by the former mill channel. Our house 'Moulin' is the former mill part of Moulin d’Ibure. Nowadays it was developed into a bright and comfortable holiday home. All guests enjoy it: families, friends and couples. The 3 rooms are lovingly furnished with comfortable beds, tables and wicker chairs. There are 2 bathrooms with bath and shower attachment, bidet and toilet. The spacious combined living and dining room is very charming. There you find the open kitchen, a dining table, sofa and TV. From here as from two rooms French windows lead out to the wooden terrace. The third room has its own balcony above the mill channel. All windows afford a splendid view of the green valley along the bordering river. The wooden terrace leads to the ample garden. First there is a sitting place surrounded by flowered bushes. Then it continues with meadows lined with mighty old plane trees to the banks of the rivulet. So there are plenty of opportunities to relax in sunshine and shadow or for children to play! Moulin d’Ibure offers plenty space to various holiday makers: couples and small families enjoy it as much as bigger or two families or friends who like to spend their vacation together! The bright cosy rooms are furnished tastefully and comfortably, wonderful places to retire not only at night time. In the kitchen you find everything to prepare a good meal and then relish it at a nicely laid table, inside or outside. The vast natural garden impresses with its mighty old plane trees, amply flowered bushes, subtropical plants and large meadows. Here you can take a sunbath, quietly read a book but also play badminton or volley. Especially our small guests adore discovering flora and fauna here and enjoy splashing around in the nearby rivulet Lihoury, when the water is low in summer. The large property is bordered by the rivulet, a copse and a high laurel hedge. Moulin d’Ibure is situated in the middle of the gently hilly landscape of the outskirts of the Pyrenees. Here you can enjoy peace and tranquillity. When you climb the outlook tower of Bardos, you will be overwhelmed by the fascinating view of the Atlantic Ocean in the west and the Pyrenees in the south! And you can easily reach both whenever you like. At the coast south of Biarritz there are plenty of nice bays to swim and north of it the well-known long white Atlantic beaches. In the back country you can discover typical picturesque Basque villages. Also a walk in the beautiful historic old town of Bayonne or Saint Jean de Luz is worthwhile. The area is a real paradise for surfers and golfers; there are various possibilities for horse riding and marvellous hike paths. Also for those who are interested in the culture life there is a lot to discover: museums as the ‘Musée Bonnat’ and the ‘Musée Basque’ in Bayonne, festivals of music and dance, not to forget the vast choice of markets providing regional delicacies! Even Spain and the pulsating cities San Sebastian, Pamplona or Bilbao with its famous Guggenheim museum are not far away. The choice what to do and where to go might be difficult and often holidays are just too short to experience all attractions. A part from coming in one’s own car, a flight combined with car hire is an attractive alternative way of travelling to this lovely region of France. There are well-priced offers to the nearby airports of Biarritz, Pau, Bordeaux, Lourdes, Toulouse or Bilbao. This way even a short one week holiday is worthwhile! Since 2002 we rent our beautiful property to holidaymakers who love France and want to discover the lovely Pays Basque region around Biarritz. Ms. Sigrid Degen or Mr. Jens Krueger shall be pleased answering all your questions. Please do not hesitate to contact us sending a message or by phone numbers +49 211 159 33 83 and +49 170 58 55 800 (cell phone)! Each bathroom has its bathtub with shower, toilet, bidet and wash basin and a window towards the garden. One of them is adjacent to a room, the other one is situated beside the central vestibule. A hair dryer is at your disposal. Lots of our guests prefer bringing along their own towels. To all others we propose them against a small fee (see rates). Our modern central heating runs with fuel. If needed we switch it on for a fee. Lots of guests prefer bringing their own bed linen. For those who want to save luggage we offer it for a fee for laundry. In a separate building there is a laundry. There you find a modern washing machine, an ironing board an an electric iron as well as clothes lines and clothes horses for outside. We offer towels per set of 3 normal and one large for a fee for laundry. Please bring along your own beach towels. Very large garden with meadows, old plane trees, roses, hydrangeas, palms and various other trees. 6 deck chairs. Moulin has a wooden deck at its East and Southside. There you have a Teak dining table with 6 matching chairs and a parasol. Nous avons apprécié le charme de la propriété dans un environnement de verdure et de calme tout en disposant de tout le confort moderne. Le jardin, ombragé et fleuri, et le murmure de la rivière nous ont ravis. L'emplacement est en outre idéal pour visiter le pays basque. Nous nous réjouissons beaucoup, que Madame et Monsieur C. ont tellement apprécié notre maison confortable, le grand jardin et le joli Pays Basque. Merci à eux d'avoir donné leur avis pour d'autres intressés! Nous serons enchantés de souhaiter la bienvenue à eux encore une fois. It´s an isolate building in the French countryside sourronded by some farmers. You can arrive to the French Basque Coast (Biarritz, Capbreton, Hossegor...) and some interesting basque little villages in moreless 45 minutes by car. The Moulin is very comfortable, wide and very well-equipped. There is a big garden with an exuberant vegetation where you can play, read, sleep or simply listen. We appreciated a lot the place, the sounds of the air, trees, birds, water, the exuberance of the nature and, in my opinion, the silence. In the morning, you wake-up with the sun rays accross the window and listening the sounds of birds in the garden. In the afternoon you can read some book listening the air moving the trees, the water in the river and the birds. We had the pleasure that the Moulin was "given" to us for two weeks. welming. The drive to the Moulin gives away that the place of the Moulin is very secluded and the serrounding garden of the Moulin is a joy for the eye. Our first impressions where "ohhhh"! In the Moulin you will find all the comfort you need. A lovely lady takes care over the Moulin an not the least over you with your arrival. It is hartwarming and it makes you feel very special. During our stay in the Moulin it was a very fine home base for all the trips we made in the area and we always had the feeling to come home when we came back from a trip. Très bonne semaine dans le Moulin d'Ibure! En pleine nature, cette maison est très confortable, très propre, et les équipements sont de bonne qualité. Les lits sont particulièrement confortables. Le jardin est immense, très ombragé, et entouré d'une rivière. Propriétaire charmante, qui a répondu très vite et très précisément à nos questions. Tout était bien organisé. Tout petit bémol : la mitoyenneté avec l'autre partie du moulin, qui est aussi loué. Dans notre cas les voisins étaient charmants. Aussi le fait que le lave linge soit à partager avec les autres locataires, et oblige à passer devant leur maison pour accéder à la laverie. Excepté cela, tout était parfait! Wir waren mit der Familie für zwei Wochen in der Mühle. Alle haben sich sehr wohl gefühlt, die Einrichtung ist geschmackvoll und funktional zugleich, das Grundstück traumhaft am Bach gelegen und sehr ruhig. Wir hatten einen tollen Urlaub und werden, wenn wir dürfen ;-) , wiederkommen . Lieber Herr Sven G., vielen Dank für Ihre positive Resonanz und die Bewertung. Wir freuen uns sehr, dass es Ihnen und Ihrer Familie bei uns so gut gefallen hat. Wenn Sie noch einen Urlaub im schönen französischen Baskenland verbringen möchten, sind Sie natürlich wieder herzlich willkommen in der Moulin d'Ibure! Inzwischen alles Gute. To fully enjoy vacation in Moulin d'Ibure and its most attractive surrounding nearby the Atlantic coast, a car will be necessary. For those guests who do not want to come with their own car, a flight combined with car rental is an attractive way of travelling to this lovely region of France. There are several airports in the surrounding: from the nearest in Biarritz it takes 30 minutes, from Pau less than 1 hour, from Lourdes about 1,5 hours, from Bordeaux or Bilbao about 2 hours and from Toulouse 2,5 hours. Especially for our guests coming from England or Ireland there are interesting low budget flight offers, e.g. with Ryan Air or easyjet to Biarritz or Pau. This way even a short one week holiday is worthwhile! The typical Basque village is located a bit away from the tourist centers just 30km east of Biarritz. It is the perfect starting point for wonderful excursions to the seaside and the mountains, in the lovely back-country with its picturesque villages and to attractive towns like Bayonne, Saint Jean de Luz, Bordeaux or in nearby Spain Pamplona and Bilbao with its famous Guggenheim museum. A special highlight in 2016 is the european capitol of culture San Sebastian! It takes only 30 minutes to reach the lovely bays and splendid long beaches at the coast. The center of the village is 3km from Moulin d’Ibure. There you have a restaurant, a café-bar, a bakery, a butcher, a grocery store, a supermarket, each Thursday morning a market and the post office. In the nearby surrounding you will find a lot more shopping facilities, also on traditional markets which offer lots of delightful regional delicacies. Right in the neighborhood there is the “Bois de Mixe” a protected forest with lovely promenades. Wanderers find gorgeous hike paths in the surrounding hills, the nearby Pyrenees and along the coast. There are various possibilities for horse riding too. Also for those who are interested in the culture life there is a lot to discover: museums as the ‘Musée Bonnat’ and the ‘Musée Basque’ in Bayonne, festivals of music and dance, the traditional festivals in the villages, old abbeys, prehistoric caves and much more. Golf and surf have a long tradition in the region. For enthusiasts of these sports it is a real paradise! Nearby along the coast from Ciboure in the South over Saint Jean de Luz, Bidart, Biarritz and Anglet up to Les Landes and in the outskirts golfers will find a lot of excellent courts. 11 of them can easily be reached in about 30 to 40 minutes by the motorways A63 and A64. They are situated in a splendid landscape and often provide spectacular views of the sea or the mountains. For swimming with young children off the waves of the Atlantic ocean nearby there are recreation centers featuring various other watersport opportunities too at the lakes ‘Lac de Sames’ and 'Lac des Arroques'. The villages La Bastide Clairence and Bidache have open air pools. We send detailed tipps and information about all this to our guests before arrival.